Shel Silverstein’s The Giving Tree, if it were about my Uncle Donnie. If my relationship with my uncle had been the inspiration for Shel Silverstein’s The Giving Tree. Once there was an Uncle Donnie Tree. And he loved, or at least managed to tolerate, a little boy—so long as the boy didn’t talk too much, or accidentally scrape off any of his bark, or really do much of anything at all. And every day the boy would climb up the Uncle Donnie Tree’s trunk and swing from his branches. And the Uncle Donnie Tree would mutter angrily to himself in his thick New Jersey accent and do his best to shake the boy off. And they would play hide-and-seek, only sometimes the Uncle Donnie Tree would say, “Ready or not, here I come,” and then not actually search for the boy, so that the boy would end up spending a good hour hunched behind a nearby rock waiting in vain for the Uncle Donnie Tree to find him. Still, the boy loved the Uncle Donnie Tree … very much. And the Uncle Donnie Tree, while not exactly happy, could put on a good face—especially on those days when he managed to persuade the boy to pour a couple of cold brewskies down around his roots. And the Uncle Donnie Tree was sure the boy was joking. “Seriously?” said the Uncle Donnie Tree. The Uncle Donnie Tree still thought the boy had to be joking. But the boy just stood there with an imploring look that left a dull pain at the base of the Uncle Donnie Tree’s trunk. “What part of ‘I’m a tree’ don’t you understand?” the Uncle Donnie Tree finally asked. And the boy started to cry, and the Uncle Donnie Tree, to his own surprise, felt a little bad. And so the boy did. The boy stayed away for a long time. And, oh, the Uncle Donnie Tree was happy that the boy had stopped hounding him for cash. And the Uncle Donnie Tree wondered if there was a way to get the boy to take one step to the right so that he might drop an apple on his thick skull. So the boy cut down a branch and totaled his Corolla. The boy stayed away for a long time, and when he came back yet again, the Uncle Donnie Tree said, “F my life,” in a sort of hushed voiced that made it seem as though he were trying to say it to himself when really it was fully intended for the boy’s ears. And the boy started to cut down the Uncle Donnie Tree’s trunk. And the boy made a boat and sailed away. And the Uncle Donnie Tree pondered whether it was possible to pull his own roots out of the ground. And after a long time the boy came back, and the Uncle Donnie Tree tried to imagine what else the boy could possibly do. Then it hit him: And the Uncle Donnie Tree waited for the boy to open his fly. And the boy shook his head and sat down on his stump. And for a brief, terrifying moment, the Uncle Donnie Tree thought that he had been optimistic in anticipating only a No. 1. But the boy merely sat and rested. 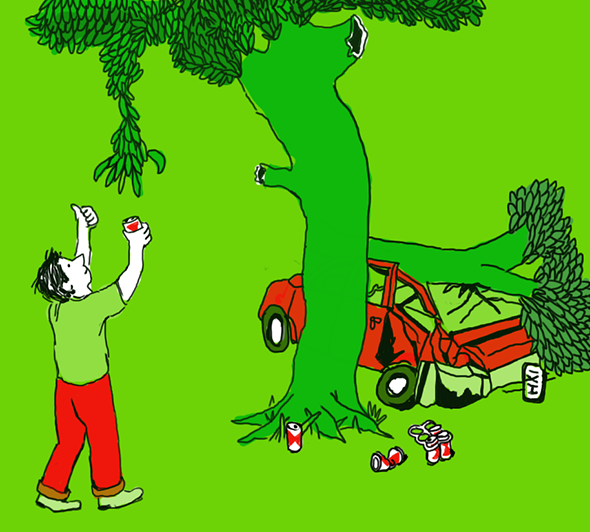 And the Uncle Donnie Tree was, if not happy, hopeful that he might still get one last brewskie out of the boy.